This was a fabulous gathering in Charles Town, Jefferson County, WV, home of my great great grandmother Mary Catherine (Goens) Marsh and family. I met some extraordinary individuals. As you know good food, kitchen table and a porch will bring a lot of people together. We all link to Jefferson County via our enslaved and/or free ancestors. I finally met a “white” Washington. Yes, I am serious, Walter and his cousin Sarah Brown opened his home for our gathering. I had never met a white Washington, Walter is a Washington. I only know of African American with the surname Washington’s, well besides President George Washington. Walter and Sarah were gracious and we all love them dearly. We are bonded by our research and our family ties. This will not be the last time we gather. We hope we can locate other descendants of the slaves who were owned by the Washington family in Jefferson County, Virginia/WV. The work will continue. Thank you Joyceann for writing the article. Yes, there is more to come. 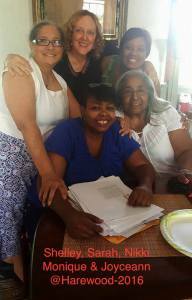 Middle row; Leah Ferrell (Kelley’s daughter, Joyceann’s granddaughter), Monique Crippen-Hopkins,Marilyn M Morton (Joyceann’s sister).